In August of 2013, I was diagnosed with stage 2b testicular cancer. To help me get through my treatment to beat the disease, I kept a journal. This book includes all of my writing starting soon after I was diagnosed to May of 2014, roughly 5 months after my treatment ended. Also included with this book is a crazy relationship story and a Ball Cancer FAQ. Click here for the Amazon link: Diary of a Uniballer. After treatment for testicular cancer in 2013, I packed my bags and went to Southeast Asia (and Australia) for 116 days. The trip included stops in Thailand, Malaysia, Indonesia, Singapore, and Australia. This book is my journal from the road. Inside you will find my observations, jokes, frustrations, enjoyment and photographs from my adventure. From February to April, 2015, I traveled through Central America. I visited Nicaragua, Costa Rica and Panama. This book is my travel journal from the road. 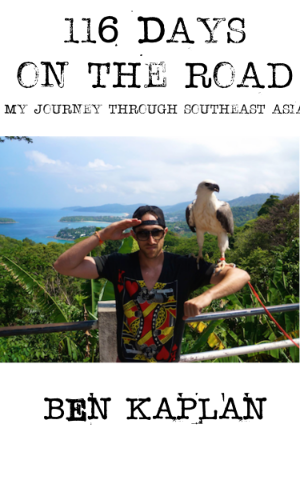 I wrote about things like surfing in San Juan del Sur, Nicaragua, going to national parks in Manuel Antonio, Costa Rica, finding an island paradise in Bocas del Toro, Panama, meeting locals, and feeling like a tourist.